The location is beautiful and the owners are so friendly. I was traveling alone when I went to Beach Cove Lodge. They were very welcoming and were more than happy to help me with my trip. The rooms were very comfortable and clean. The location was perfect. I have no words to describe how beautiful it is. It is worth the Price and the drive. If you are not from Ireland, I wouldn't recommend driving yourself. Perfect stay! highly recomended. We will come back one day! Staying at the Beach Cove Lodge was a true pleasure. Bridie was exceptionally kind and generous, the room and bathroom were immaculately clean and the location couldn't have been better. Although there isn't a hot breakfast, there was tea/coffee, muesli, juice, milk and granola bars. We were there during a terrific windstorm which made it strangely romantic being safe inside a centuries old house when the elements were raging. A great experience from booking the reservation to checking out. Highly recommended! We were warmly welcomed and made to feel at home. Our accommodations were very nice, clean and comfortable. Thank you! Outstanding hosts-one of our most welcoming! Really appreciated Bridie's attention to all our needs. She set us up with a Skellig trip without any problems. She helped my wife with a medical complaint. Will visit again if given the opportunity. This is a wonderful place to stay. Very welcoming, relaxing and a beautiful location looking at the beach. The stay was great and the full Irish breakfast was fabulous. Hope to stay here longer next time. Spectacular Location. What a great location for a bed and breakfast right at St. Finians Cove. Bridie and Jack are wonderful hosts and have plenty of time for a chat. Out the door straight across the road and you are on the beach. The Skelling Ring is a great drive with fantastic views. Breakfast at Beach Cove is perfect and plenty to set you on your way. Plenty of advise offered on where to eat locally which is always helpful if you don't know the area really well. We will return again as this Beach Cove is as good as it gets. 5 stars all round for hospitality and location. Kind regards from Pat and Breda. A beautiful homely place in a stunning location with great and helpful location. My husband and I, along with my sister and her husband, stayed for only one night here. We arrived late, and left early, but everything was good. Brett was so helpful in getting us booked onto a boat to take us to Skellig Michael! We were so grateful for this. The setting of her place is lovely, and the breakfast was good. Lovely place, great location, a very nice couple owning and running the b+b. Rooms were nice and spacious, breakfast was very good, my vegetarian wife loved the pancakes and fruit. Awesome spot to relax with great things to do a short drive away. We're already thinking about staying here again on our next trip to Ireland. Had an amazing stay. Thank you! Lovely stay. Bridie was very welcoming and helpful with recommendations on where to eat/best routes to take when driving the ring of kerry. The room was clean with a beautiful view of the beach. We really enjoyed our stay, the breakfast was good, and we would definitely come back next time we visit Ireland! 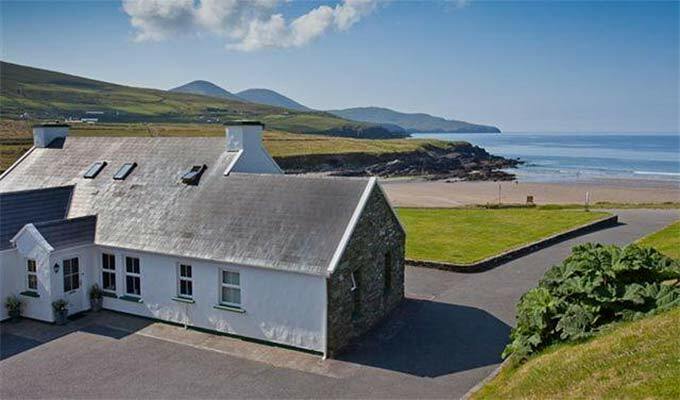 Her house is a great location if you want to have a secluded beach spot, but is also only 10 minutes to portmagee and 25 minutes to waterville. We have been traveling for over 2 weeks in Ireland and this is by far one of my favorites! Helen is a wonderful host, the location spectacular! It is an isolated spot - quiet - and the beach pristine. With weather clear, the full moon over the water with the Skelligs in the distance gave us a peaceful break from our travels. Excellent place highly recommend this B&B Bridie very welcoming and food delicious. Will go back again without hesitation. Excellent B&B in perfect Location with a wonderful View from the Room over St. Finians Bay. Beach for swimming and surfing a few Steps across the Road. Great Breakfast and very friendly and attentive Hosts. Bridie and Jack O´Connor made us feel like home and it was hard to leave. Definaltely in my personal Top 5 of B&B´s in Ireland! Hope to be back soon. We were already the second time there. Simply brilliant, the location right on the Ring of Kerry, Skellig Ring and at St. Finian's Bay. Bridie, the owner, is so nice, helpful and accommodating. The rooms was very nice with views of the sea. Very good breakfast with great view in the breakfast-room. This time we had the small house in the backyard alone for us, just beautiful. This is a beautiful site and you couldn't find nicer folks to stay with. The room is wonderful and we left the window open so we could hear waves crashing all night. We will go back! Beautiful, restful B & B with wonderful hosts. Bridie and Jack are very welcoming and the breakfasts were delicious. We spent three nights and enjoyed visiting the chocolate factory just down the road, touring Valentia and driving the crazy lane ways. We used this location as a base for touring the Ring of Kerry. Probably our favorite B&B during our recent trip to Ireland! Bridie was such a wonderful host! A wonderful place in a great location and Bridie was a terrific hostess. The location was quiet and peaceful immediately across from a stunning little beach with a glimpse of the Skelligs. The room was very good as was the delicious breakfast. Bridie was amazingly helpful and at the last minute was able to secure us a spot on the boat visiting Skellig Michael. Would love to return and, if so, would make Beach Cove B&B a major attraction. Our stay at Beach Cove was very short, as we arrived late and left early. But Bridie was a lovely host, full of enthusiasm and warmth. We had hoped to ferry to Skellig Michael and thought we couldn't get onto a boat; then we learned that Bridie had made reservations for us. That trip was a highlight of our time in Ireland, and we owe it all to her. We would recommend her B&B to anyone. This place is out there!! Nice quiet locations. You can hear the ocean at night. Very professional hosts. Get an upstairs room for the view. Beach Cove is an elegant and cosy home in front of a spectacular landscape on the Skelligs islands. We had a very friendly welcome there by a charming lady and made an excellent stopover there. We could only stay a night and the weather was mostly rainy, but Bridie had everything in full readiness for us: a tasty hot breakfast, and arrangements to boat to Skellig Michael. A beautiful room and stunning location, with friendly reception. Breakfast was fine, although I would have benefitted from a menu detailing the options for the cooked breakfast, since the 'Full Irish' was not what I expected, and thus I was slightly disappointed. Had I known what was in a 'Full Irish', I would have chosen something different. Gorgeous location, clean, comfy rooms, and wonderful hosts, Beach Cove far exceeded our expectations. The view is spectacular, and Bridie's warmth made us feel right at home. The food was delicious and got us off to a good start every morning. I can't return soon enough. Steep staircase, but otherwise perfect. Absolutely beautiful location, and we could see Skellig Michael from the window of our room and from the windows of the breakfast room. Amazing! Hostess was absolutely charming and helpful in all aspects. We had come in late that afternoon, and she gave us the perfect recommendation to go to for lunch. Could not be happier! Why is it not possible to give 10 stars for location it is exactly, as seen in the picture above!! This place is a true gem, everything was perfect!! The room - super cozy with incredible sea views and the sound of the ocean as a lullaby. The owners - very friendly and helpful, prepared a delicious Irish breakfast for us and kept the freshly baked pancakes coming! Five star!! We are really not getting paid for this review, it was simply a wonderful stay at the Beach Cove. We will be back! It was the best place we stayed during our trip! Bridie is very nice and caring. The location of the House is amazing. The Rooms are beautiful and clean. The Breackfast was delicious. And the waterpressure of the shower was awsome : I´m defenitly coming back! This was such an excellent location for us during our vacation in Ireland. Bridie was the perfect host, the room was spotless, and what a great Irish breakfast. If your looking for a quiet, lovely place to stay for a few days, this is it! We could not have asked for anything better. Thanks to Bridie and her husband for allowing us to share their home, and arranging our excursions in the area. My husband and I stayed here during one night on our honeymoon. It was such the perfect break from all the tourist-y things we had been doing. If you plan on staying anywhere on the Ring of Kerry I suggest staying here. It was the perfect location...the beach was just a few steps away and had a beautiful view of Skellig Michael. Birdie was a wonderful host and suggested some wonderful places to go during our visit. Just a short drive from Portmagee where we went for dinner. I wish we could have stayed longer! Fantastic! This is a wonderful B&B. Lovely rooms, lovely decor, a perfect location and a warm welcome. The view from our bedroom was breathtaking. This is our second visit and we hope to return many more times. Our stay at the Beach Cove was great, as usual. This was our 3rd or 4th time staying there. Bridie and Jack are wonderful hosts. I'll be back. We always run down there when we vacation in Dingle. Well worth the trip. WONDERFUL!! Beautiful location - one of the best views ever. Birdie was very accommodating. Short drive to the skellig michael boats and a great Irish breakfast to send us off! Nice stay at beach cove. we enjoy the rooms and the view on the beach. The breakfast was very good. Absolutely wonderful location. We enjoyed the accomodation apartment and double room, very helpful and friendly hosts and a great breakfast every morning. We were very satisfied with this B & B. Lovely location and very good service and information. Absolutely wonderful! Beautiful property and great hosts! Make sure to stop for something to eat before arriving in the town. We traveled in Ireland over a span of twelve days, staying in mostly B&B's. This was our favorite stay!! The remote location, the spectacular setting, hostess Bridie O'Connor's wonderful accommodation, and especially their breakfast room environment were unforgettable. This is a fantastic place to stay! A lovely place, an excellent B&B with a great hospitality! We appreciated a lot our room with view to the sea. The Beach Cove was an ideal location for a peaceful and quiet start to our week in Ireland. We enjoyed our stay in this very clean and well maintained house. The owners were gracious and very helpful, We look forward to returning. The rooms were lovely and the view could not have been any better. We had a family suite that easily fit 4 and gave you privacy. Short distance to Portmagee and walking distance to Skellig Chocolate factory. It was our first B&B during our 2-weeks journey in Ireland and we loved it!!! It is very well located in front of the sea. The service is fantastic and the owner is really warm, discussing with us while serving the breakfast. We definetely recommend this B&B! Perfect stay. Nice room and a fabulous view. We had a restful over night in this quiet & cozy Beach Cove B&B, nested away on the magical Ring of Skellig. It was a wonderful stay and we are very happy, that we spent not only one night at Beach Cove. We enjoyed all: the house, the rooms, the view, the marvellous breakfast and the very nice and friendly owners, Bridie and Jack. Thank you so much for the great time our family had at your B&B. We hope, we can visit you once again !!! Fabulous quiet location and fabulous accommodation. Our stay at the Beach Cove was one of the highlights of our trip to Ireland. The O'Connors were very gracious. Though we arrived at the inn well before check-in, our room was ready for us. Information about the area was freely given and arrangements for our outing to Skellig Michael were made by Bridie. Breakfasts were generous and delicious and were served in their beautiful dining room with a view. My husband and I look forward to returning to the Beach Cove again someday. We will highly recommend this lovely get-away to friends and family. Beach Cove is an absolute gem! It is located directly across the street from a bay, which the breakfast room overlooks. Our rooms the triple, suite 1 I believe also had one room that overlooked the bay. The hosts were extremely helpful in recommending nearby restaurants, booking us a tour to Skellig Michael, and even making a homemade hot chocolate made with chocolate from the Skellig Chocolate factory with my daughter's breakfast. This is a clean, attractive & memorable B&B and I look forward to the opportunity to stay here again. This place was terrific. The room was very nice, spacious, with a small window that opened out to the ocean. It was away from any populated areas, 4 miles from the small town of Portmagee, our destination, over a narrow, winding road topping Cumanaspic hill. About the same distance from Ballanskelligs to the south. Very dark and quiet at night, nothing but the sound of the ocean. Great hosts, hooked me up with the boat ride out to Skellig Michael. The food was good, house was beautiful, hosts were friendly and informative. I would love to stay here again, maybe for a longer period of time. We had a wonderful stay Beach Cove. The location is absolutely stunning. We felt welcomed immediately and our room was very clean and comfortable. We were hoping to visit the Skellig islands and Bridie made the arrangements for us. She is a wonderful host and the food was very tasty. If you are lucky enough to be passing through this area, it is completely worthwhile to stay more than just one night. I would recommend you book at beach cove. We stayed for two nights, the price is extremely affordable and you will enjoy every moment. This was by far our best stay in Ireland! The home was beautiful, Bridie was a delight and THAT VIEW! Will return! Beautiful isolated location. Great room with a view of the beach. Good breakfast. I would definitely stay here again. Three ladies stayed here September 6th for the night. Bridie was exactly what a hostess should be, warm, caring, and helpful. Our two rooms were lovely and clean, the shower hot, and the breakfast a happy affair. We had a lovely chat at breakfast which included her husband and our welcome was warm and sincere. Only one negative, and nothing to do with the B&B...... Not one pub in this lovely Financial Bay area, so if you want a nightcap at a local town be very careful driving on these narrow roads. We WILL visit again! Thanks Bridie and Jack from the Florida ladies. Me and my party of three had a fantastic stay at the Beach Cove B&B. We stayed for only one night and regretted not being able to spend more time there. The location was stellar, right on a beach and right in the middle of fantastic scenery. We were booked into a triple room in the outhouse, which had all the amenities we could have asked for and was clean and beautiful. The breakfast was delicious and the landlady very helpful and friendly. We'd stay there again in a heartbeat. Very kind hosts, great location - just perfect ! A gem that is quietly set on the beach.. Family owned with a personal touch.. Bridie was very nice, the suite was amazing and the breakfast was very good.. Highly recommend! AMAZING! We absolutely loved our time here and it is as pretty as advertised. Perfect, quiet, picturesque place. Fantastic room design. Good adress with a very friendly welcome. Our favorite B&B in Ireland! Beautiful location, great breakfast, and Bridie was an excellent host! This place was amazing! Right near the water, beautiful rooms, delicious breakfast, wonderful hosts. I would highly recommend staying here. This is one of the best places I have ever been to! Bridie and Jack were lovely and very warm, welcoming and helpful with all practical issues. Breakfast was super. The location very quiet, peaceful and at the same time with many interesting places closeby. Beach Cove was amazing - as was Bridie! She had a whole little 2-bedroom apartment set aside for us 2 adults and 2 teenage children, which was perfect. Our son went and swam in the ocean which is essentially at your front door. Breakfast was delicious. Cannot recommend more highly! cela fait 2 fois que nous restons à Beach Cove pour 2 jours.A 4 ans d'intervale aucun soucis de qualité. Beautiful Place, we´ll come back! Great place to stay...left a note on the door when we arrived later than expected, good recommendations on what to do/where to eat in Portamagee. Good breakfast with the best coffee I had the entire week in Ireland! Everything was great, Bridie was as nice as could be. She makes great pancakes. Couldn't have been better. We found this gem on the B&B website. Location was amazing, practically on the beach. Was a little bit off the beaten path but I think that's kind of the point. The owner, Bridie, was very hospitable with not only our accommodations but also with area attractions. We very much felt at home. Room was clean and comfortable. If we find ourselves in this part of the world again, we will definitely stay at Beach Cove! I submitted an inquiry through your website. The B&B responded with an email and a reference number. So I went back to your website with the reference number and booked a one night stay with the Beach Cove B&B. I went back to your website a week later and reviewed our confirmation. Upon arriving at the Beach Cove B&B we were informed that your website was very misleading and a confirmation and booking reference from your website does not mean that the Beach Cove B&B has "accepted our confirmation". The owner was by no means kind about the situation and kept telling me that it was our fault for not contacting her directly. The Beach Cove B&B should be removed from your website! Beautiful location overlooking the bay. We had a triple room en-suite at the front with sea views. Very clean and comfortable and very friendly host.. We had a good choice for breakfast that was well prepared and presented. Amazing B&B! Wake up and ocean view! In my opinion most wild place for a Ireland B&B! Fantastic Stay at Beach Cove. Spectacular views and warm hospitality from Bridie and Jack O "Connor. Bridie took care of booking trip to the Skellig Michael which was an extraodinary adventure. Ballinskelligs is a wonderful stop on the journey around the Ring of Kerry. Definitely will be back. The best B and B we had during our trip through Ireland. It was very welcoming, the rooms were comfortable with a nice design. There was the short way to the beach and Jack and Birdie were always very helpful. We felt home. we stayed overnight we were welcomed with great kindness the room is very neat, very clean, with sea view only little negative point, the shower room is small and we were not able to dry our clothes because unfortunately it rained a lot! We had a wonderful stay at the Beach Cove Our family room was very clean and comfortable, with a wonderful view of the beach and the Skellig islands It is in a great location for day trips to anywhere on The Ring of Kerry We immediately felt at home with Bridie and her family Our favorite place we stayed, while on our two week tour of Ireland!! We simply cannot say enough wonderful things about the beachcove B&B Of all our lovely accomodations in Ireland, this one was by far and away the best Bridie is a large-hearted hostess who makes you feel at home the moment you walk in the door and helped us extensively with plans to tour the Skelligs and see the area Her beds are big and comfortable, breakfasts delicious, and a beach literally right outside the door, complete with frolicking dolphins Our only complaint was that our time there ended far too soon! On our recent trip to Kerry we spent 4 nights at Beach Cove B&B in St Finans Bay and would highly recommend it Our room was excellent with magnificent views over the beach to Skelligs rocks on the horizon Our hostess, Bridie, was a very warm and welcoming person, full of local knowledge and extremely helpful, organising trips and providing answers or recommendations for anything we needed Beach cove is stunning in every way and a place we would definitely recommend to anyone visiting Kerry we'll be back! It is everything the description on her website says it is and more!! !